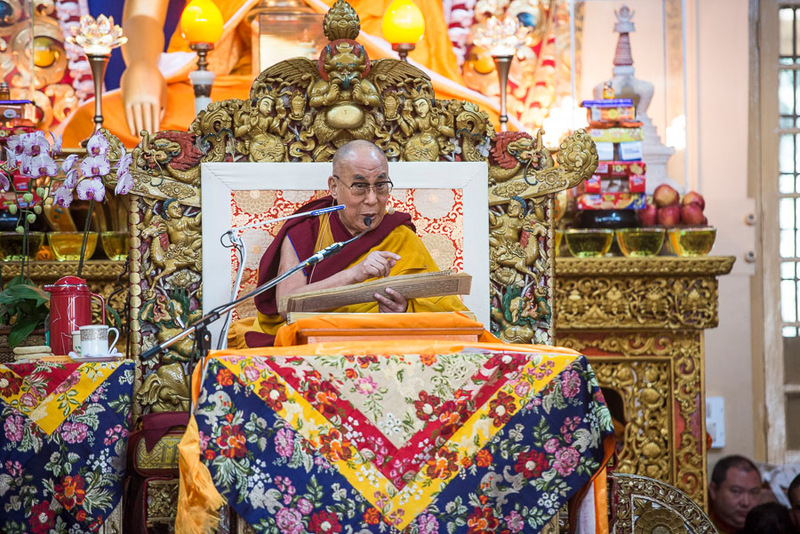 (TibetanReview.net, Dec04, 2014) – Tibet’s exiled spiritual leader, the Dalai Lama, on Dec 2 began four days of religious teaching requested by devotees from Mongolia at the Tsuglakhang, the main Buddhist temple in Dharamshala, located next to his residence. About 4000 devotees, including 600 Mongolians and visitors from 49 countries, are attending the teaching. Top Tibetan Buddhist scholars, the Ganden Tri Rinpoche and the Jangtse Chöjey, are also attending the teaching which is on the Tsongkhapa’s ‘Lam-rim Chen-mo’ (the ‘Great Stages of the Path to Enlightenment’). He preceded his teaching by talking about the deep historical connections between Tibet and Mongolia, as well as China, and how Mongols, especially from the regions of Tuva, Buryatia and Kalmykia, had produced some great Buddhist scholars in the past and how the religion declined there under communist rule. He expressed happiness over the fact that while visiting Mongolia in 1979, he had noticed that the people’s religious faith had remained strong underneath the restrictions imposed under communist rule.